The last assignment for Blog Week couldn’t have come at a better time for me. I’m in a place in my life where I can see that all the great things I’m looking forward to, have been slowly but surely making their way to me since starting this blog back in 2011. To make your dreams reality, it’s good to look back to see where you began so that you can appreciate how far you have come, because gratitude is the great multiplier in Life. The more you appreciate what you have, the more you have. 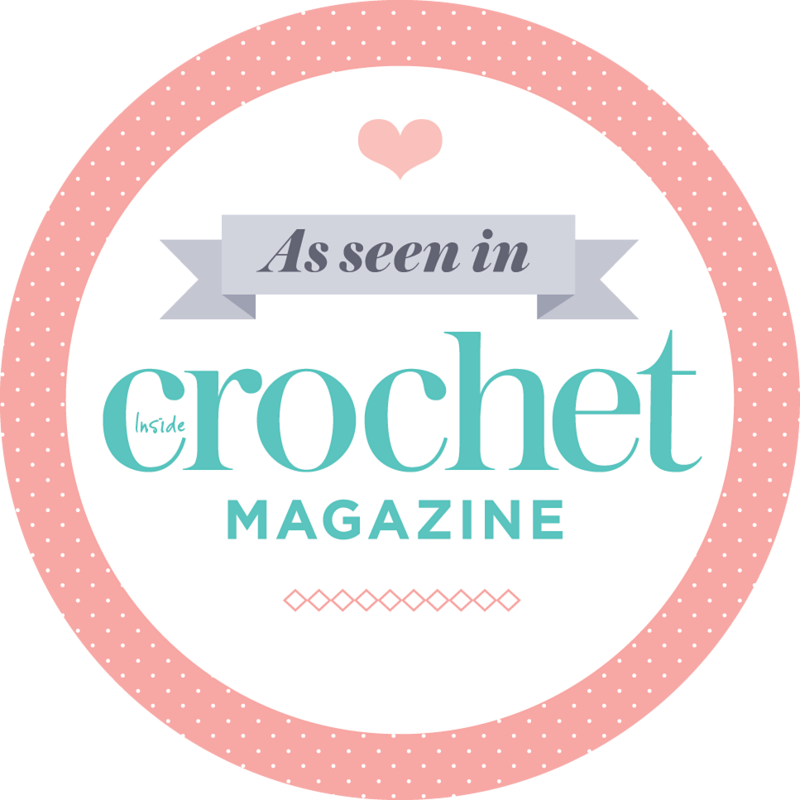 When I started my blog it was purely to share my absolute passion of crochet. As I learned more techniques, found amazing yarn, great patterns and saw inspiration all around, all I wanted to do was to share this with my blog readers. Over the last year I found I wanted to share crochet with people face-to-face at groups or workshops and to spend more hours of my day surrounded by things that would inspire me to be creative – things like sunny gardens, blue skies, the comfort of my home, time to really read and comment (not just glance and hit the “like” button) beautiful blogs and doing crochet or knitting (because while I knit and crochet creative juices really flow). What was holding me back was having to go to work five days a week. I blogged about this conundrum in March here, but the need to break away from the office have been coming on a very very long time. I just don’t want to say out loud, or type, the words of complaint and frustration too much because just as gratitude can multiply the good things, so too complaining can multiply the bad things. In the meantime my dear husband had also been looking for a career change. Through a series of events, most of which were brought on by his positive attitude, he is now doing his dream job for more money. Best of all he didn’t even have to change firms – he still works with the same people, at the same place, 10 minute walk from home. Then, in February I grabbed an opportunity that has the potential to change my life. A fellow PA announced that she was going on maternity leave. She works only Monday to Wednesday….. I put myself forward to do her maternity cover, and I got it! As of this week, I only work Monday to Wednesday! 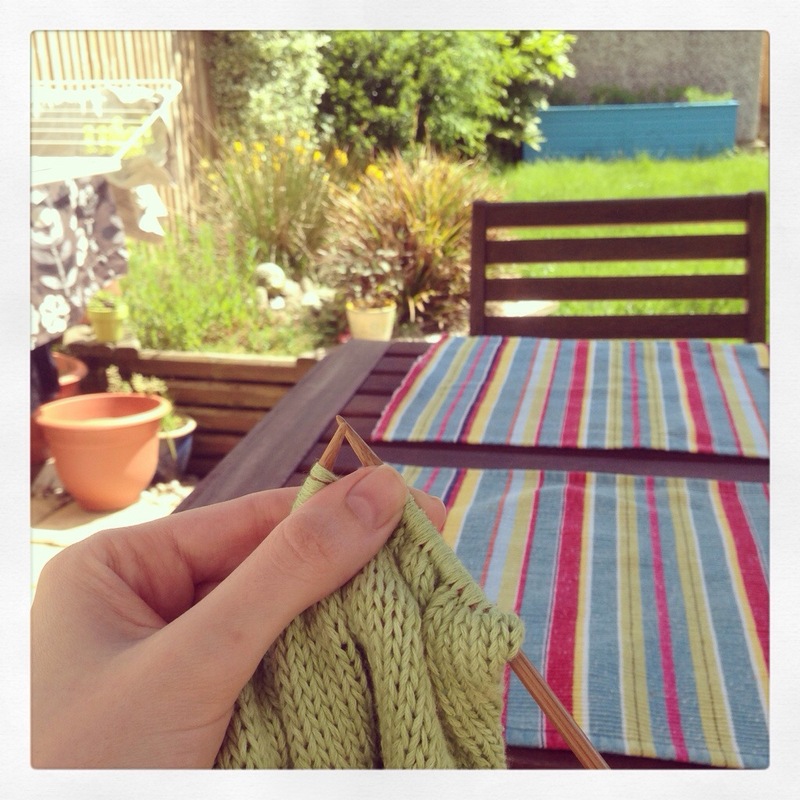 Thursdays and Fridays are now blogging, photography, crocheting and knitting days! Yes, my salary is less, but with John’s new role and his excellent financial planning, we don’t have to worry too much. We’ve also made a few small changes (like rethinking the type of train ticket I buy and not getting a bi-weekly cleaning service any more), but I am so happy! With my free time I can now set wheels in motion to turn my hobby into a career. Thursday was my first day at home. It was amazing! It started with a morning tea overlooking the garden while the laundry was drying. Mid-morning I caught up with The Big Allotment Challenge. 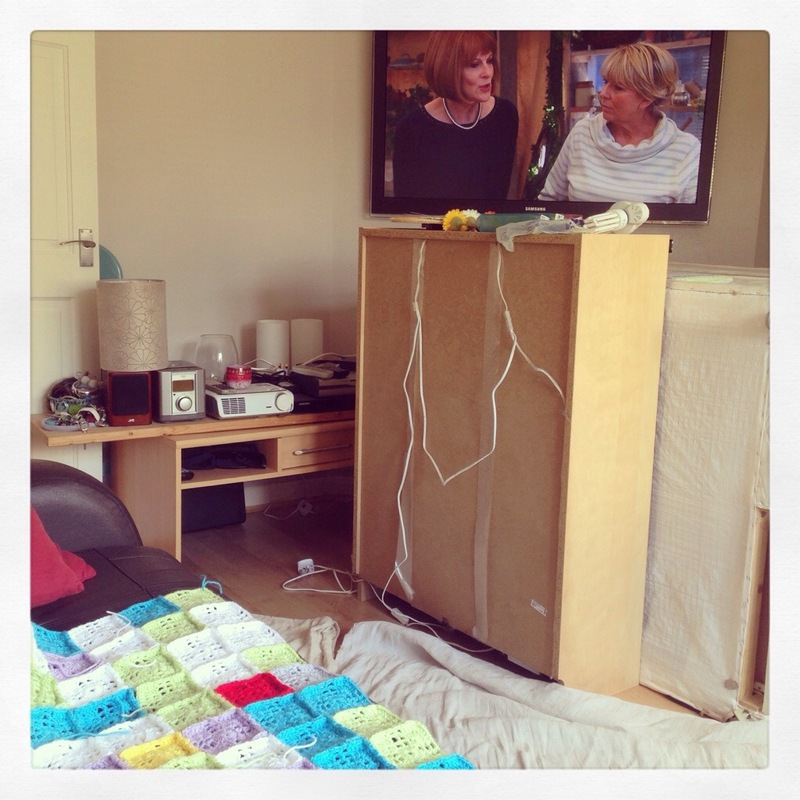 This is where things get a bit nasty… our bedroom has been unusable since the Bank Holiday weekend. John replaced the ceiling with a new one that has better sound proofing (we live in the ground floor of a maisonette and our upstairs neighbours are very noisy….). It was a massive job but he did it wonderfully. Now we have plasterers in to skim the new ceiling and the walls. When they are done, John and I will paint everything white and then we get a new carpet. I can’t wait to have our bedroom back! Until then, our bedroom furniture is all over the place, including the living room. I soon got tired of looking at the back of the book case and two halves of the bed base, so I moved the knitting outdoors. Then it was time to prepare lunch. Lunch with John! If you think I’m happy to be home on Thursdays and Fridays, you should see John! He loves that he can spend his lunch hour with me. 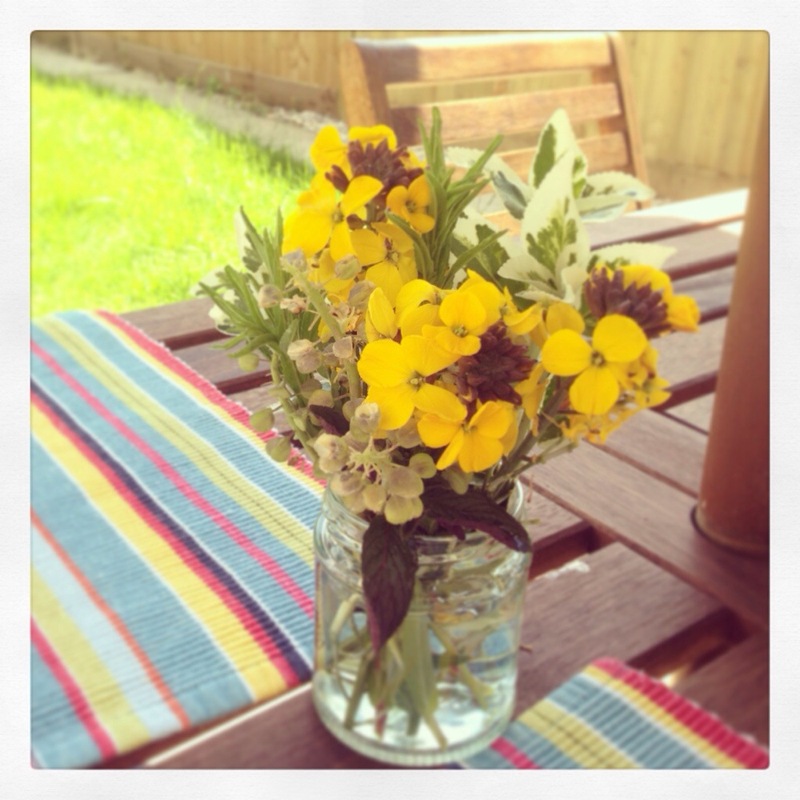 I set the table with placemats and a little posy of flowers from the garden. 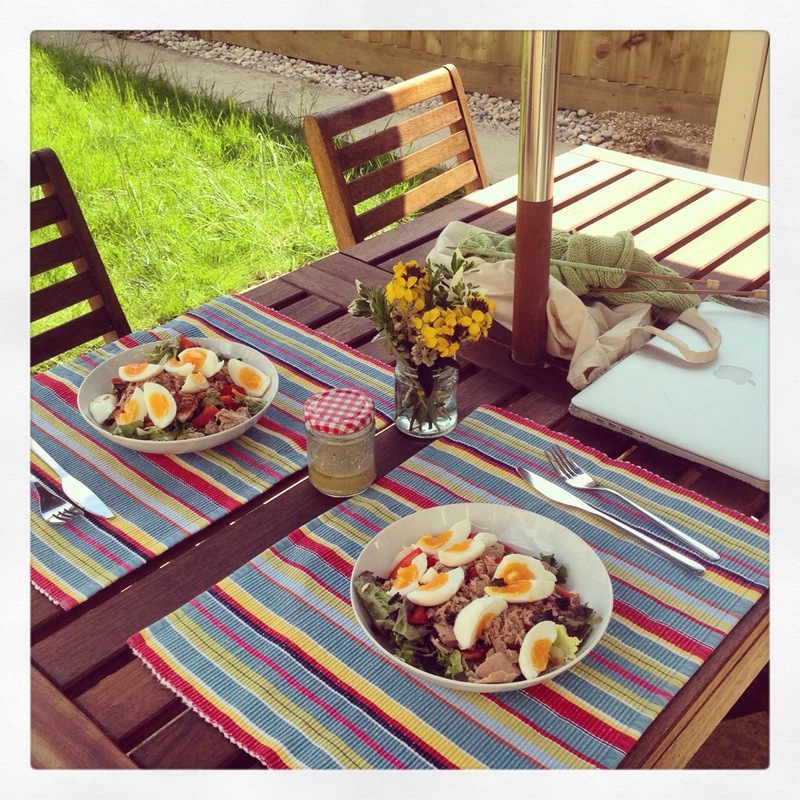 I made a salad and quick lemon juice & thyme dressing. My knitting and laptop is still on the table within reach. Of course. 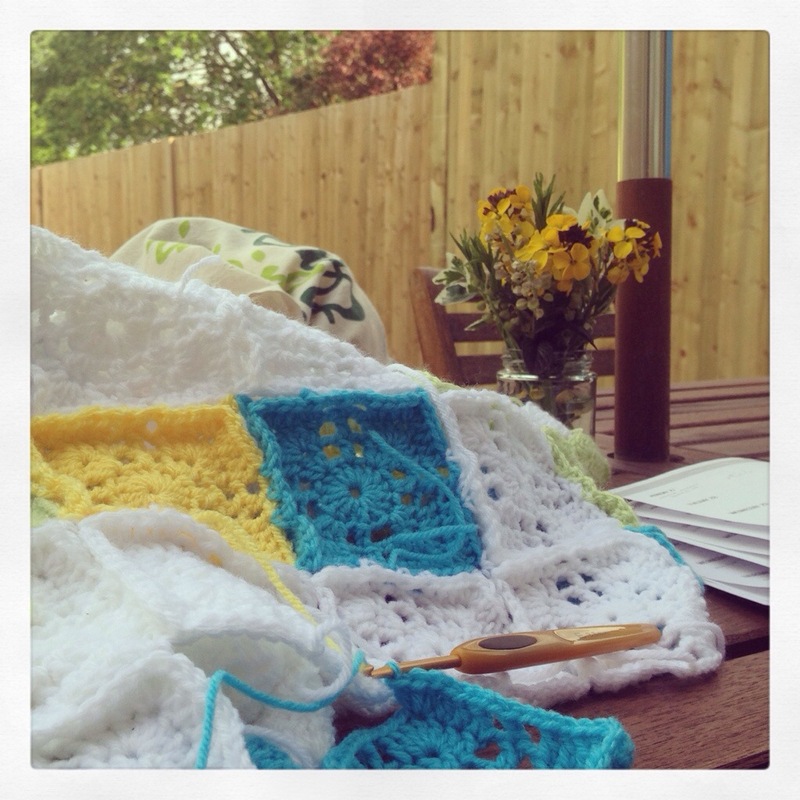 When things in the living room / bedroom campsite got too much I moved outside again to continue working on Crochet Mood Blanket. I got up every now and again to check on the dinner (no housewife is worth her salt if dinner is not on the table when husband gets home) and pack away laundry. If I say “pack away laundry”, I mean fold it and pile on top of any of the three stacks of wardrobe drawers on the floor of the study. Our clothes are not neat (or easy to find), but at least it’s clean. I really had the most amazing day. 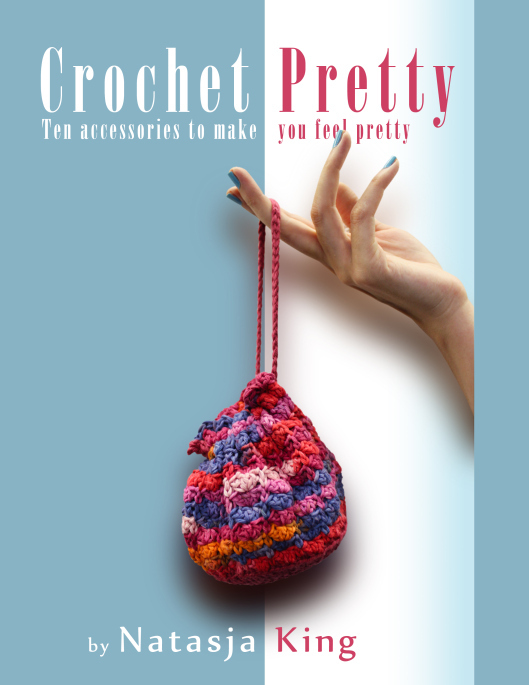 I just know that because I’m so happy, relaxed and busy doing what I love, everything, including the crochet workshops I’m holding, is going to work out. How could it not? In the meantime, I’ll follow my own advice – I won’t focus on the messy house I’m in now but rather focus on the beautiful white walls and modern bathroom that is to come. And to take my attention away from dust and inconvenience? I’ll knit and crochet. Absolutely looking forward! 🙂 Well done.